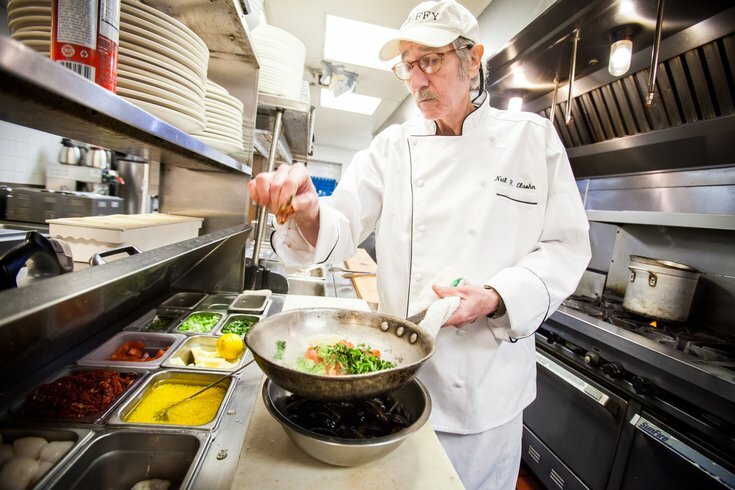 Executive Chef Neil R. Elsohn prepares a dish in the kitchen at Max's Seafood Cafe in Gloucester City, N.J. He has been chef there for about a year. Chef Neil R. Elsohn has had more second acts than a cat has lives. After heading kitchens at standout restaurants from the ocean – The Water’s Edge in Cape May and Gertrudes in Ventnor – to the Delaware River, at Max’s Seafood Café in Gloucester City, he’s soon to launch what might be his finale in the kitchen. It's been an odyssey of sorts, with a few restaurant misadventures in between he’d rather not recall. Then, in 2003, inoperable pancreatic cancer derailed his kitchen career – and nearly killed him. “I was literally dying,” said Elsohn, 62. At his sickest, he was down 100 pounds, the aggressive tumor wrapped tightly around a main abdominal artery. Megadoses of chemotherapy and “a lifetime of radiation” killed the cancer – and wiped out Elsohn. The following year came a "Whipple," a complex operation to remove tumors in his pancreas. The man nicknamed “Cheffy” was alive after treatment, but far too weak for 70-plus hour workweeks on his feet required of an executive chef. His cancer coincided with a doubling of the rent at the Waters Edge restaurant, which he closed in 2005 after a near two-decade run filled with raves from foodies and critics. A short-lived venture of his own folded, and then came a succession of cooking for others, followed by the 2008 opening of his own tiny BYOB, Gertrudes. Max's Seafood Cafe in Gloucester City, where Neil Elsohn has been chef for about a year. Though the place named after his mother was a smash for two years, featuring Elsohn’s signature melting pot dishes drawn from mashed-up ethnic cuisines, he was still too weakened to keep up his pace as “the godfather of new American cuisine,” as one critic had dubbed him. He sold Gertrudes to a sous chef. Meanwhile, his wife, Karen Fullerton-Elsohn, had gone back to college and become a registered nurse, assuring an income and advocating for her husband’s health. He took a series of “stupid little jobs” as he rebuilt his strength. In 2014, his health intervened, threatening to kill him once again. This time it was a one-two attack of E.coli and sepsis, a by-product of his abdominal surgery and compromised immune system. Feeling stronger finally, he answered a Craigslist ad in early 2015 for the position at Max’s and found his chef groove again. The menu at Max's features some Elsohn favorites. Blackened day boat scallops with a mouth-watering, caramel-preserved ginger glaze he’s cooked for 25 years. Mussels fixed six different ways. Several of his signature dry-aged prime steak dishes. And a cedar-planked salmon that was too good to take off the menu he inherited when he took over the kitchen a year ago. In a bit of redemption for both himself and working class Gloucester City, with its dockside gantry cranes lining the river, Elsohn will, in a few weeks, launch his newest encore, a relocated rendition of a reimagined Chubby’s 1½, including a 22-ounce porterhouse, classic drinks such as sazeracs, and a deep wine list. 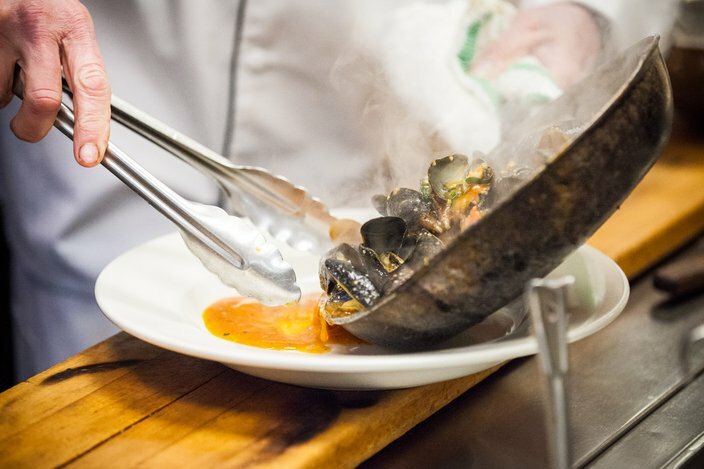 Chef Neil Elsohn prepares 'Max's Famous Red Mussles,' a staple at Max's Seafood Cafe restaurant. The old Chubby’s, at first a jazz bar back in the 1930s, then a landmark steakhouse and hangout in the 1950s, operated for more than six decades in Haddon Township. It closed in 1995, but the family of the boxer for whom the place was named sold the rights to the Chubby’s name to two Toms – business partners Tom Monahan and Tom Page. Chubby’s new location on Burlington Street was once a pharmacy and then a doctor’s office before closing years ago. Beautifully restored and featuring an art deco bar, the new Chubby’s will join Max’s, a jewel box of a restaurant just a block away. Joe Papzrycki, the producing artistic director of the South Camden Theater Company, is thrilled – and not just because he lives a few doors away – though there is that, of course. "We go to Max's on every opening night and have something to eat and drink before we open. It's my good luck charm," said Papzrycki, who eats there about twice a month. "And I can't wait. Having Chubby's back is fantastic. My uncle tended bar at Chubby's. It was our special occasion place. It's a wonderful thing," he said. Restored more than a decade ago, Max’s is the sort of place where a member of The Hooters routinely plays on Friday nights while diners consume bowls of mussels and craft beers in a location adjacent to an American Legion canteen. But Elsohn has put his own stamp on the place since arriving. “We had instant synergy,” said Monahan. “I have creative freedom within parameters,” added Elsohn. Fellow chef Michael Huber has eaten Elsohn's food for years. "He's been around forever," he said. "He has a style all of his own, unlike any other. Eclectic." It’s been a twisty path for a guy who started out teaching yoga, tai chi and taekwondo in North Jersey before going to college at the age of 30 for restaurant training. “I was always cooking for my friends,” he recalled. Neil Elsohn will soon add another kitchen to his purview, at the revived Chubby's, a throwback steakhouse with a legendary name. After college – at what was then the New School for Social Research – he found himself “peeling onions” and kicking around a long succession of restaurants. But his schooling gave him “confidence in my own ability,” and he scored higher than his younger classmates because he only started college he was ready. “I really wanted it,” he recalled. “At the Waters Edge, creativity and quality never slip,” said Elsohn, quoting a review by the late restaurant critic Ed Hitzel. "It just took off after that. I’ll never forget it," Elsohn recalled. By 1986 he was an executive chef at a huge restaurant and banquet operation in tony Bernardsville, New Jersey, with 40 cooks working for him. A vacation in September 1986 to Cape May changed his life. The town had revived itself perhaps a decade sooner, based on history, architecture and food. Confident he could flourish there, he and his wife began searching for a location for what became The Waters Edge. The property, opened just before July 4th, 1987, looked like “a sunken Denny’s.” But it came with a fully equipped kitchen, a liquor license and great location. Open for every meal of the day, the restaurant was a success from the outset. Then came the fall of 1988 review in The Press of Atlantic City newspaper which boosted his restaurant into the stratosphere. 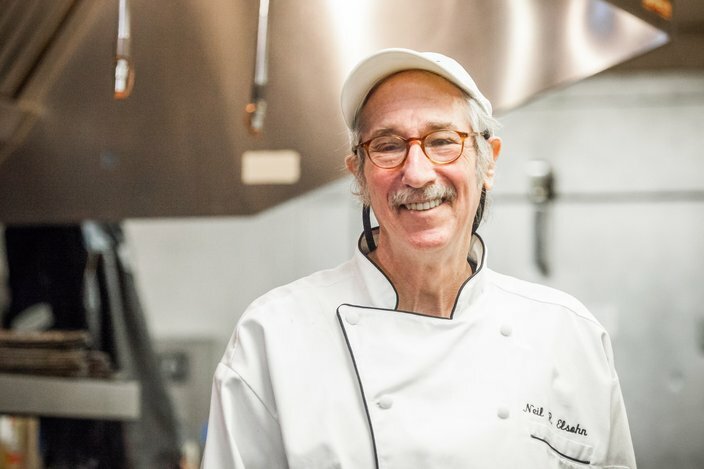 “At the Waters Edge, creativity and quality never slip,” said Elsohn, quoting the late Ed Hitzel, a restaurant critic who soon became a friend. “It just took off after that. I’ll never forget it,” Elsohn recalled. And now Elsohn works to repeat that success as he simultaneously oversees the kitchens at both Max's and Chubby's. 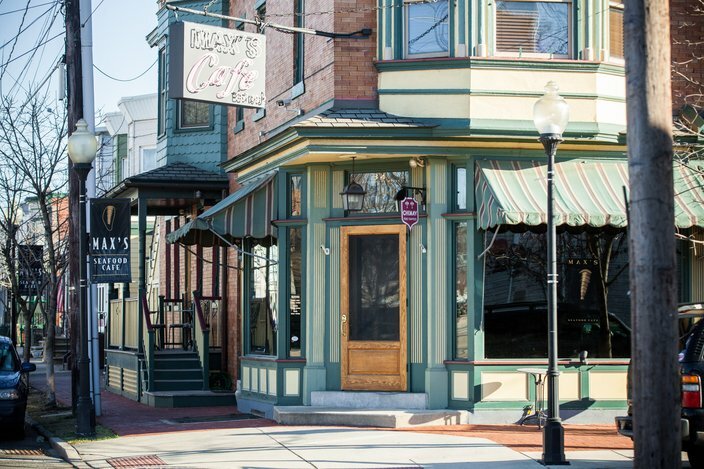 He and his restaurants’ owners are hoping his chops in the kitchen and their investment in the properties make them into destination dining spots – and kicks off a bit of gentrification in Gloucester City.